Once upon a time restaurants advertised that their food was just like home-made. Then there was frozen food that was just like home-made. Then a strange thing happened: They started saying the frozen stuff was just like take-out. While we’re taking this walk down memory lane … Jenn and I used to like eating out. But we’ve both gotten so good at cooking that restaurants usually disappoint us. Except wings. 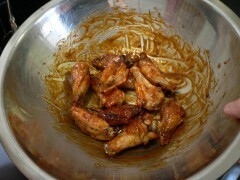 Man, wing places are awesome. So a while back I asked if anyone had ever worked at a wing place, and what was their secret? Turns out lots of them deep fry, which I’m not going to do. Others use a two-step cooking process. From the ideas there I came up with a method to try, and it worked great. Here’s the secret for take-out style wings, for both a dry rub and a traditional BBQ sauce. Before you start, ask yourself: Do I want the best wings or the easiest cleanup? 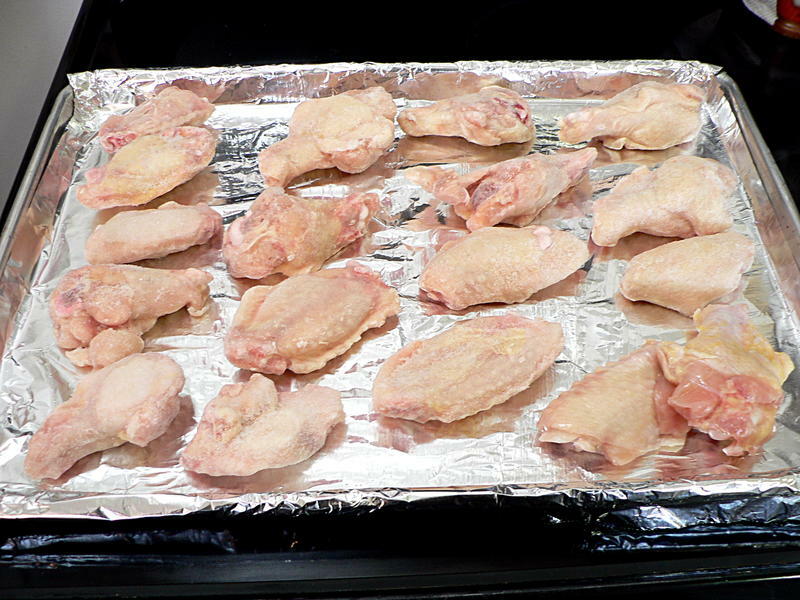 When I did this batch I didn’t want to deal with cleaning up the baking sheet when I was done so I lined it with aluminum foil. We didn’t have any heavy-duty, so I used the thin stuff. Mistake. Next time I’ll just oil the pan a little bit and deal with the cleaning. 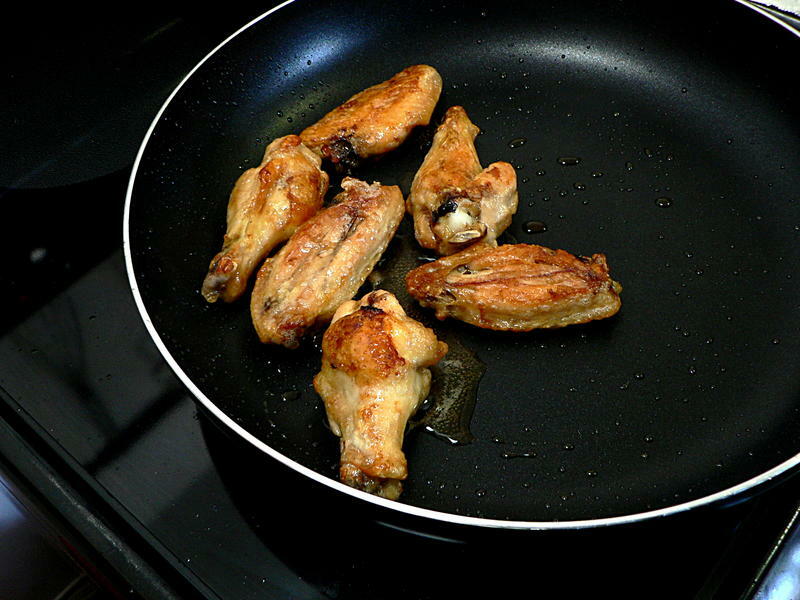 Brush a thin layer of olive oil on a baking sheet and pre-heat the oven to 450° F. (Oh, if you’re going to be using BBQ sauce take out of the fridge now so it’s not still cold when you put it on.) 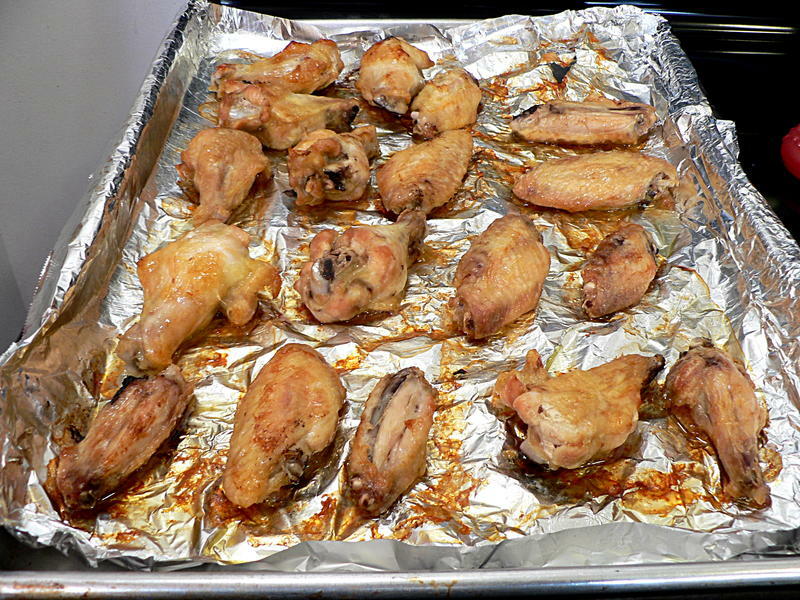 Spread the wings out in a single layer and pop them in the oven for about 10-15 minutes. Turn the wings over, turn the heat down to 350° and put them back in. 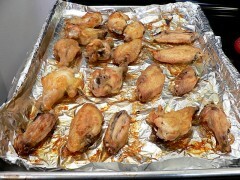 Every 10-15 minutes turn the wings over to make sure they’re not sticking. 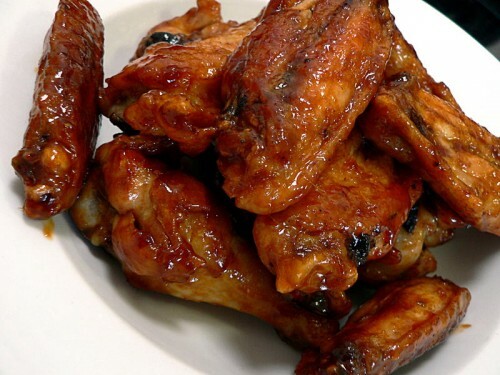 Depending on how meaty your wings are it should take 45 minutes to an hour-and-a-quarter. 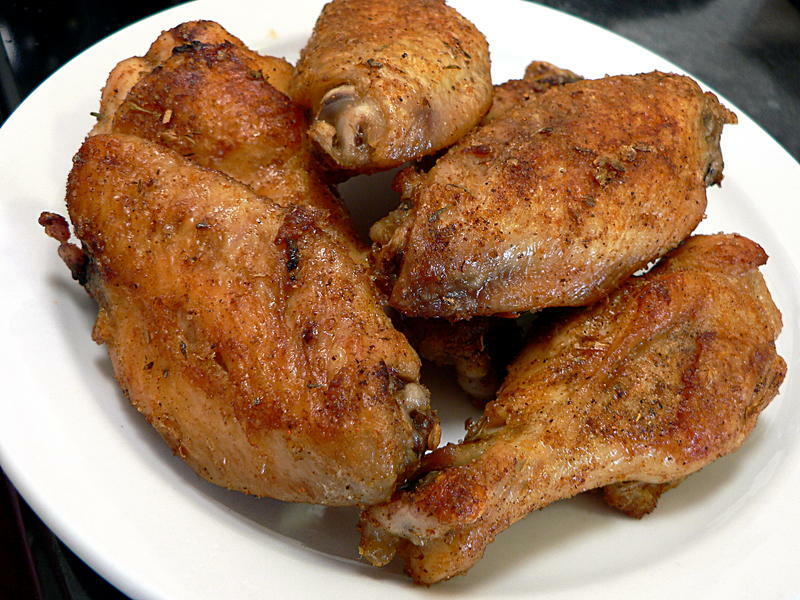 Stick a knife in the thickest drumstick, they’re done when the meat is white all the way through to the bone. Now comes the magic. 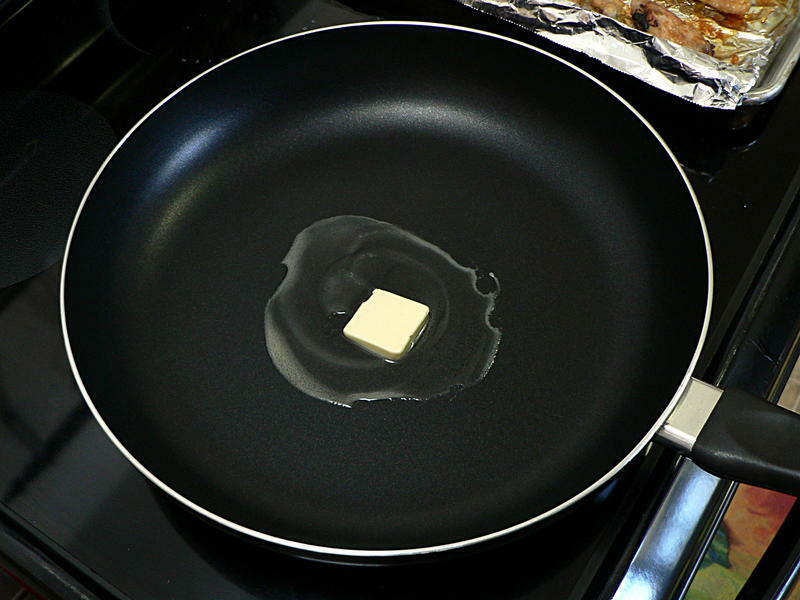 In a large nonstick frying pan melt a tablespoon of butter over high heat. Toss the wings in about six to twelve at a time. 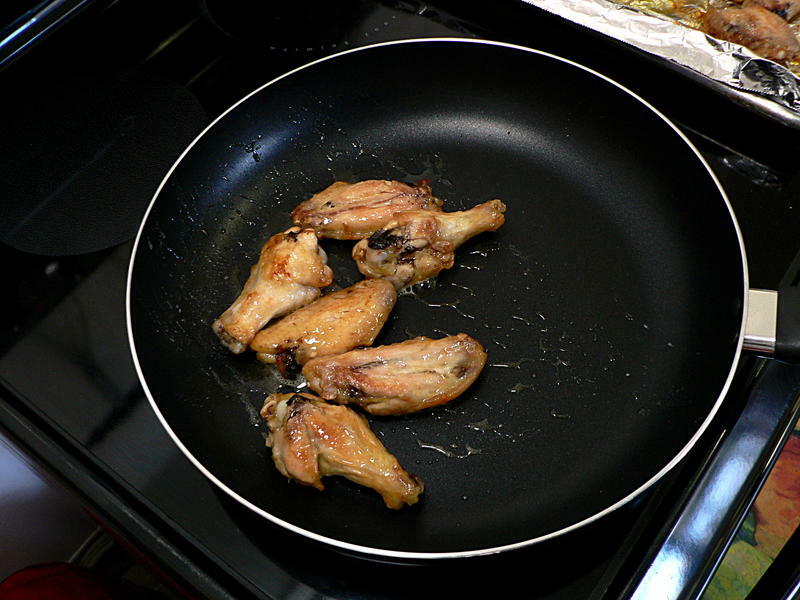 Make sure there’s room in the pan to toss them around. Obviously the bigger the pan the more you can do at once. 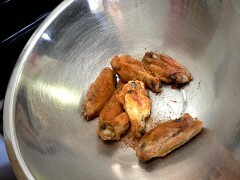 Fry until the skin is crisped up all around. Here’s the second trick to learn from the restaurants: Cook first, then season. Transfer the cooked wings to a large bowl and apply a generous helping of your dry rub and toss them to coat all around. 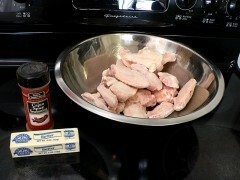 The butter and rendered chicken fat will be more than enough for the rub to stick to. 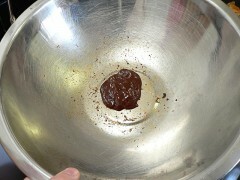 If you’re doing some with dry rub and some with sauce, do the dry rub first. … or the dry rub. PS: Don’t forget the blue cheese dip.